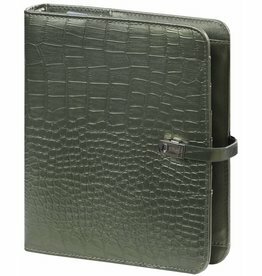 Beautiful stylish artificial leather A4 writing case. The writing case contains an A4 writing pad, cream-coloured paper without lines. A writing aid is included. The writing case contains extra storage compartments. Outside dimension writing case: 330 x 260 x 25 mm. Beautiful B6 Personal organizer with magnet clip. Inside on the left and right side is a pocket for cards or papers. Under the closing clip there is room for a pen. The high-quality ring mechanism is compatible with Collins, Filofax and Success. This organizer comes with a calendar (1 week on 2 pages). The organizer features 5 tabs, a page separator and an address-book. The calendar contains ample room for personal information, calendars and planners. Outside dimension organizer: 195 x 125 x 40 mm. Personal paper size in calendar: 170 x 95 mm. With notepad in size of organizer in size of organizer of 160 pages. Each leaf is the size of the organizer with 6 holes. You can easily save your notes from the notepad in your organizer. Beautiful stylish artificial leather A4 writing case. The writing case contains an A4 writing pad, cream-coloured paper without lines. A writing aid is included. The writing case contains extra stor-age compartments.